The development of early literacy skills is crucial to children’s future educational success. It provides a gateway to communicate effectively, comprehend the world we live in and it facilitates the ability to investigate all other subject areas. We enjoy our own celebrations of Children’s Book Week at kindy, not with character parades but by sharing our love of books and reading and creating our own books to share with each other. We are passionate about developing children’s literacy skills through their own interests, skills and as part of the games the children are developing themselves. One of the most enjoyable ways to foster and extend children’s natural interest in literacy is by sharing great stories and rhymes. Tips for Awareness of Books, Words and Letters. How Does a Book Look? When you are reading with your child, take the time to look at the cover of the book. Look at the title, the author and illustrator and perhaps discuss if you have read other stories by this author. Reading Follows Print: As you read, run your finger along the print so that your child makes the connection that you are reading the words. Alphabet Fun: When your child shows an interest, expose them to the letters of the alphabet and more importantly the sounds they make. 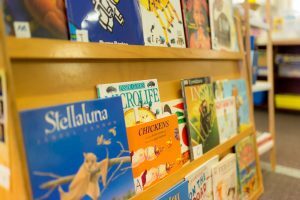 Home Authors: Help your child make their own books. Print the words they tell you below their pictures, photos and paintings. Print Walking (or driving): When you are out walking, driving or shopping with your child look at the signs around you, the labels on food packets, street signs, directions, shop names, words on buses and buildings. Where’s The Writing? When your child shows an interest show them all the places we use reading and writing. Food packets, recipe books, shop catalogues, newspapers, order forms, TV guides, manuals for equipment, directions on packets, letters, postcards, price lists etc and of course our favourite story books. While true “reading readiness” is a neurological stage of development that cannot be hurried along until each individual child has reached the required stage of development we can make sure that we foster a love and respect for books, stories and reading by making the pre reading stage full of fun and positive experiences. At Camp Hill Kindy we are lucky to have an extensive collection of wonderful children’s books. We are always adding to our collection and really appreciate the fund raising efforts of parents that provide us with the opportunity to purchase new books and resources. We welcome suggestions of new titles that you or your child may have recently enjoyed. Happy Reading! !